I’ve agreed to write a chapter for a very exciting new collection being edited by Robin Goodfellow and Mary Lea, titled Literacy in the Digital University (Robin’s blog on the same subject is here). I’m grateful for the opportunity to be part of this project. My chapter is going to explore how “course management software” is shaping our pedagogy – in and out of the classroom – in ways we both understand and ways that may be more subtle. More to the point, though, is that I think the construction and use of this software (Blackboard and the like) is often antithetical to what we regard as good writing pedagogy and the effective uses of digital media. So here’s where I’m going with this right now. Course management software, such as Blackboard, is purchased by universities and often required of faculty and students for everything from distribution of course materials to posting of grades. This software is promoted by university administrations as a set of effective pedagogical tools for use both in and out of the classroom. Yet such software is often hierarchical, rigid, and prescriptive – the antithesis of the kinds of participatory environment most conducive to creative thinking by students and faculty. It is imposed on teachers and students from the top down, difficult to modify or customize, and makes assumptions about teaching and learning that, again, tend to be rigid and hierarchical. I see the adoption and promotion of such software as driven by material and ideological imperatives of efficiency, control, and surveillance that are increasingly central to way the institution of the university works in contemporary culture. Course management software is promoted by university administrations as an efficient and centralized method of “managing” university courses. Faculty response to the use of such software is often to complain or shrug, and acquiesce to the demands of the institution. Yet in doing so we are complicit in reproducing institutional and cultural ideologies that are as hierarchical, rigid, and prescriptive as the software. In this way dominant ideological conceptions of knowledge and literacy – tied to notions of efficiency – find their way into writing classrooms even as we may imagine a pedagogy that will encourage students to resist such conceptions. So in the chapter I hope, at least in part, to argue that university-imposed course management software works to reinscribe particular conceptions of epistemology and pedagogy that, as a field, we have criticized in other settings. I think it is important that we think critically and act more explicitly to resist the implementation and uses of these forms of digital media. We much also teach students to approach the use of these technologies from a more critical perspective. But all is not grim. I refuse to give up without a fight, an alternative. 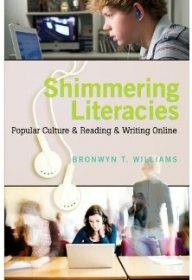 So I also want to talk about how alternatives to designing digital environments for writing pedagogy that allow students a range of ways to participate in literacy practices in ways that are flexible, critical, and creative. But I’ll save more of that for the next post (which won’t be so long in happening, I promise. January was just crazy on many levels.) More soon. Good stuff, Bronwyn — I’ll look forward to reading this. I’m actually presenting at Cs about something similar; my particular gripe is with the e-portfolio system Chalk & Wire, which (in addition to being buggy and generally painful) creates, I think, a sort of shadowy panoptic space. Students dump their work into this database, with their names and other signifiers attached, usually for purposes of curriculum assessment, which I think threatens any “safe space” policies that might have been set up for good reasons in the classroom, and also tacitly denies students the rights to the distribution of their own work. This would all be much more noticeable on paper: e.g. “Hand in your portfolios; you’ll never see them again, and you won’t know who exactly is reading them; I hope that’s okay” — I don’t know if that would go over well, but it’s essentially the same thing. One of the dangers of digital spaces, I guess. Perhaps it will be of help to you as you write your piece? Interesting post. It made me think about one of the tools that’d been hailed as a “wonderful” academic technology but which, I think, can also be a terrible tool, depending on how it is used. Wikis can turn the classroom into a digital panopticon (because students’ work is always visible to the instructor, and in the name of collaboration they have to share work in progress that they may not yet be happy with). When I used wiki in my class, I honestly share this concern, partly address it by letting students work in groups of three or maximum four instead of the whole class, and prioritize learning and sharing over “assessment” and “management.” But the discomfort remains, and this post reminded me of it. There are many other features of course management systems that bother me, one of which is this: in Blackboard, if an instructor goes under “performance” and generates reports of how students are using the system, it’s possible for him/her to watch, in numbers and charts, on what days, times, duration, and pages/applications each student has been working (or not)–and if a teacher values “managing” more than teaching, such functionalities can make it a hundred times easier to manage more than teach. I think that with the increase in functions and affordances of “academic technologies,” there needs to be a corresponding increase in–I know this sounds awkward but I believe in it sincerely–“responsible,” even respectful pedagogy–on the part of teachers. I look forward to reading your chapter.